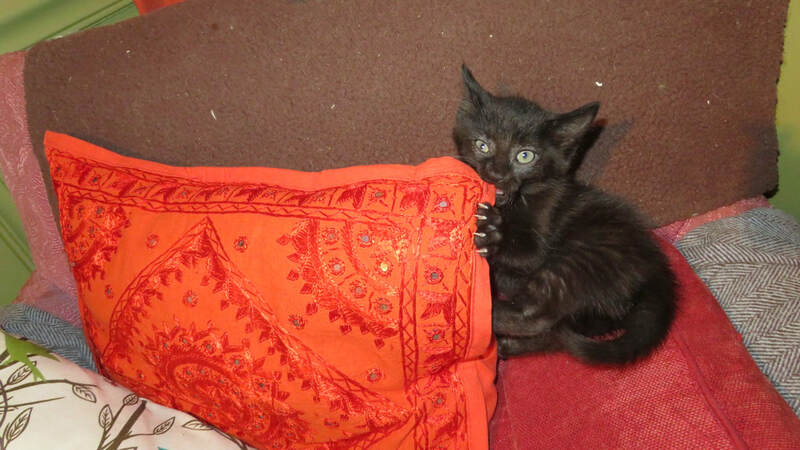 Gavin is a super energetic little kitten! He loves to wrestle, and chase the stick toy, and chomp pillows into submission. He goes and goes, until he sacks out in a puddle of adorableness. When night falls, and his people are being mellow with books, or a show, he likes to scale the couch and make himself at home. He adores having his head smooshed. Gavin gets along wonderfully with other cats, and plays with all ages. He also likes to get up on his hind legs and try to attack the dog's tail. He's pretty fearless! We're fascinated to see what color he turns out to be, since he has a silver undercoat under his black panther fur. He's a unique boy, that's for sure! If you want a rock star to rock your world, Gavin is your guy!